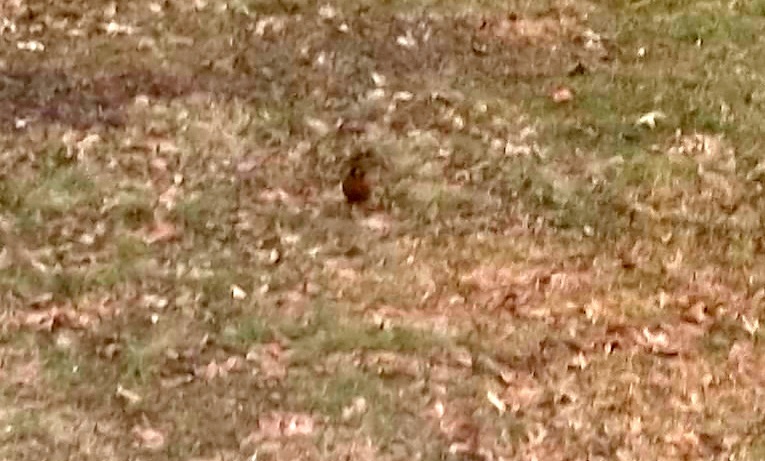 It’s a lousy picture, cos he was a long ways away, but this bird is our sign that spring will come to Pennsylvania. Robins leave here late in August and usually come back late in February or early March. They eat bugs and worms, but can live for a while on seeds and berries they might find till the ground warms up enough to have their live food. People had reported seeing some, but I saw the first ones today. There has been a snow cover on the ground for almost a month, and now it is melting finally so they can look for bugs, but probably won’t find much. This one hung around a bare spot of ground for a long while, and I kept looking to see if he was still there. It’s not spring yet, but it’ll be coming, and the robins will be glad. 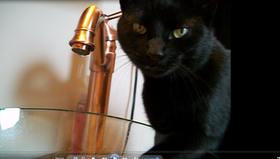 It’s been a rough winter, so the humans will be glad too. Not too much longer! The robins around here tend to stay during the winter due the availability of food so I can’t really use that as a gauge. We had a taste of spring today! It was so nice I spent most if the day outside. Unfortunately, it’s going to go back to more winter like weather tomorrow and for the rest of the week as far as I can tell. Yes, here too. We had 2 lovely 50 degree days, but now back to the regularly scheduled winter. That’s expected here, but I just hope it doesn’t get as cold as it was there for 2 weeks earlier. I hope yours isn’t so bad, and spring soon!